The days may be getting longer, but there are still many more weeks of winter to come, making this the perfect time to settle in by the wood stove, browse some magazines and dream about the amazing garden you plan to create when spring finally arrives. Creating a beautiful garden is an eminently visual process, akin to painting a beautiful picture. We ponder which plants will bloom together and how to combine them to produce a exquisite whole. We even conjure up images of ‘plein-air‘ artists like Claude Monet, working outdoors in diffuse natural light, carefully mixing their paints to recreate their own mesmerizing gardens on canvas. But we need to remember that, before putting a dab of color on the canvas, most artists spend considerable time conceiving the spatial composition for their painting—be it a still-life, a pastoral scene, or an abstract mosaic. They contemplate the space the subject will occupy—often called the positive space— how it should be positioned, how much room it will need and how the different elements of the subject relate to one another. They also consider the background—the negative space—that will surround and frame the subject. Differentiated from the subject in both color and texture, the negative space further dramatizes the final composition. And, just like creating a beautiful painting, the foundation for a gorgeous garden is a compelling spatial design where we see the different garden spaces and how they interrelate. 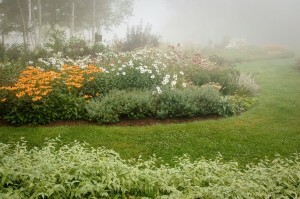 Designing a beautiful garden is like creating A PICTURE ON THE GROUND. A spatial design is your blueprint for the future, as you develop your garden the years. And since it shows the size and shape of the individual beds, it becomes your guide as you choose the permanent plants—trees, shrubs and perennials—that will populate those beds. 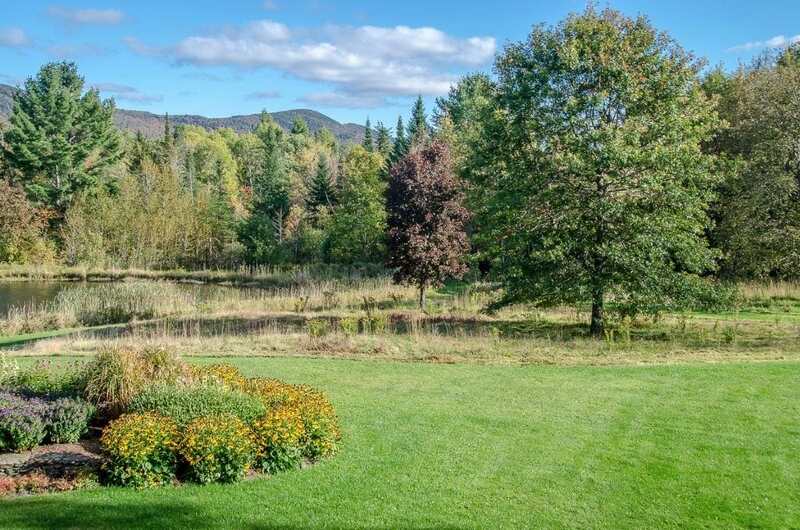 Whatever the season, as I look out from my kitchen window and across my garden, I am struck by the interplay of the different spaces—beds, lawn, hardscape and paths. And, off in the distance, my picture is framed by a backdrop of trees. Of course, when I actually walk around the garden, then it’s the details, such as this tapestry of leaves reflecting in the ground-level copper dish, that become the star attractions. The pleasure I get from my garden involves both types of encounters— the long view AND the details. But, like many of us, I spend considerably more time looking across the garden from afar, so this in fact becomes the predominate way I experience it. 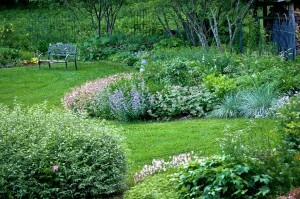 Thus giving due attention to the big spaces will go along way towards making a pleasurable garden. So let’s take a look at the different components of our gardens and how to create a spatial design that is both beautiful and yet functional and one that will stand the test of time. Whenever I work on a design for a new garden (or a remake of an existing one) the stage is set by the individual shapes of the various components—hardscape, paths, lawn and planted areas—and the way they come together to form a harmonious whole. 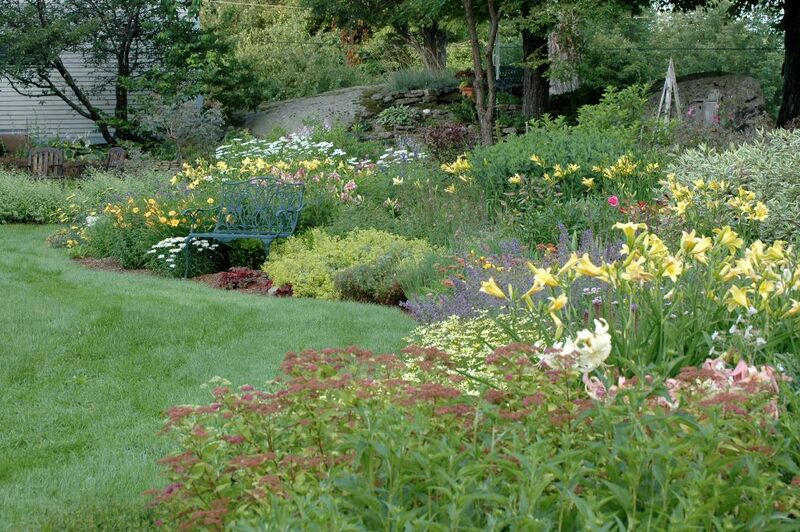 For practical reasons some garden spaces will edged with straight lines, giving them a certain formality. Obviously the outline of the house is all about straight lines. Thus the beds that abut the house will be at least partially straight-edged. And, to facilitate easy access to functional places—like the garage, woodshed or compost—the paths leading from the house are typically straight. Also, the outline for the family vegetable garden, whether it is single large cultivated area, a series of narrow beds separated by paths or a collection of raised beds, is usually square or rectangular to expedite weeding and crop rotation. But as we move beyond the house and nearby functional areas into rest of the garden, the use of smooth flowing curves, such as one might see on a contour map, tells us that we are entering a different environment, one that is relaxed and informal. Looking out from the house it is the flowerbeds that are the main focus of our attention and, as such, they create the ‘positive space’ in our garden pictures. So, as I start each new design, I begin by sketching possible shapes for the flowerbeds, favoring long sweeping shapes that will be deep enough to contain both shrubs and perennials. Typically the flowerbeds are surrounded and framed by lawn, a space in its own right that also serves to further dramatize the flowerbeds. 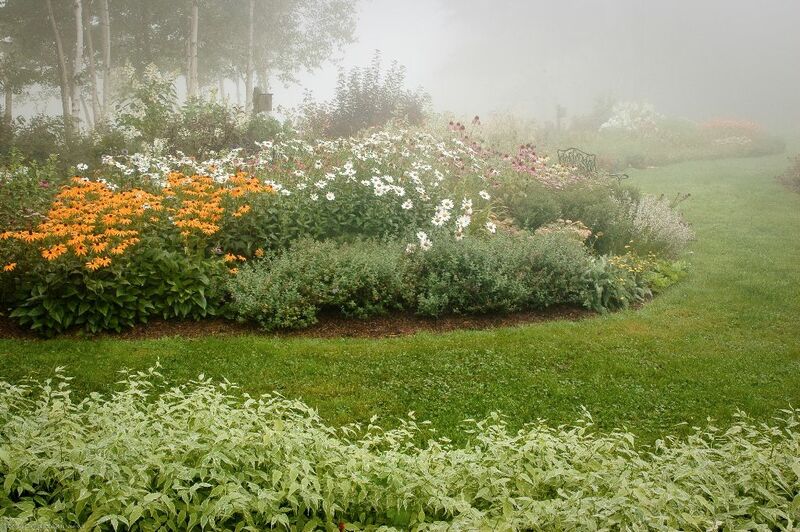 The shape of the lawn is the inversion of the shape of the flowerbeds—where one is convex the other is concave–so it is akin to the negative space in a painting. The silhouette of the lawn should have nice smooth edges with no sharp angles, encouraging us to stroll along and visit our plants up close. And of course the lawn must be easy to mow, another big reason to avoid sharp points and tight corners. With a similar eye I draw the hardscape and the paths, shaping them both for beauty as well as for function. And last but not least I consider the naturalized space, perhaps a meadow or some woodland, that lies beyond the cultivated garden. 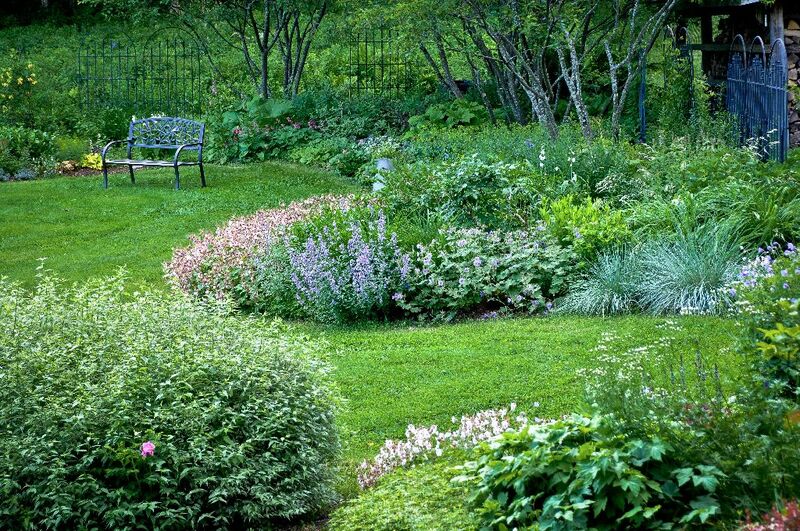 Like the lawn, these naturalized areas are spaces in their own right, contributing both shape and texture to the whole. Sometimes the simple trick of softening the line between the mown lawn and an unmown outer meadow or hedgerow changes the entire picture. 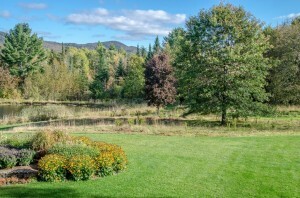 In this garden on the left, the outer lawn was replaced with a sweeping meadow that is mown just once a year. The result frames the garden and adds immeasurably to our picture on the ground while providing habitat for insects and birds. Make a map showing what is currently there, including the outline of the house, paths, hardscape and beds. This is your base plan. For a small project a rough drawing can suffice, but for a big project it is best to draw your base plan to scale (1/8th inch = 1 foot is ideal) using squared paper as a guide. If you do make you base plan on squared paper, copy it over onto a piece of plain trace paper. This will help you break away from the ‘square’ mentality’ of the house as you create curved shapes for the beds and lawn. Now place another piece of trace paper over your base plan and roughly sketch the positions of all the sitting areas and planted areas (including functional spaces such as the vegetable garden, compost and more), which together create the central focus of the garden. At this point your drawing, often called a ‘bubble chart’, will be akin to a doodle, allowing you to experiment with different ideas. Gradually refine your drawing, watching the shapes formed by the various spaces from both an aesthetic and a functional perspective. Aim for nice smooth shapes, no squiggly lines or awkward corners. 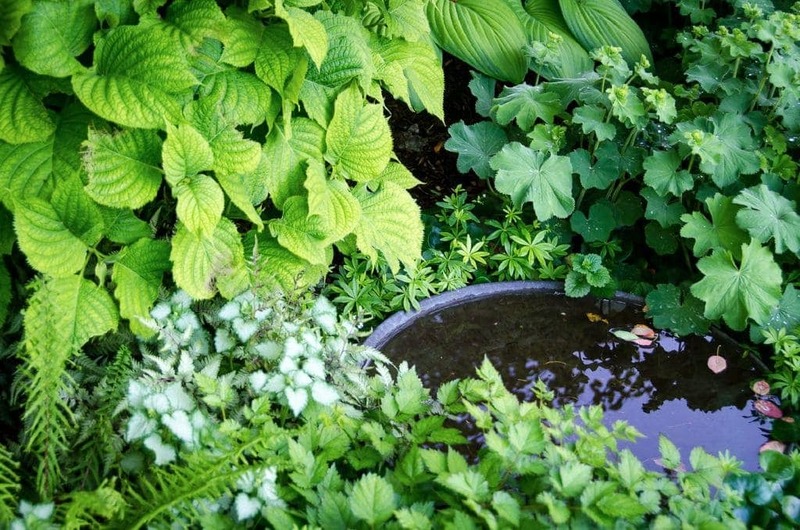 Make fewer but larger flower beds (less edge to trim) and make them deep enough to hold between two and five layers of plants– a minimum of five feet, but possibly up to twelve feet deep. Ensure that the hardscape, especially a patio or a deck where people will sit and relax, is both attractively shaped AND fully functional, with enough space for both table and chairs and for people to move around. Use straight lines or smooth gentle curves for all paths so that they are easy to navigate. Major paths should be a minimum of four feet wide to allow two people to walk together. Once you are happy with how it all looks, place a clean piece of trace paper over everything, create a final drawing and get it reproduced at a regular copy machine. In a follow-up post I will describe how to choose beautiful plants to fit your new garden beds, and be ready for a trip to the nursery when spring arrives. sketches and transfer it to CAD. Loved this article. Needed the inspiration to plan for spring. Judith, what a wonderful way to describe garden design. This was such a joy to read.